My inlaid photo guest book puzzles are designed in a way that combines my blank guest book and photo guest book puzzle designs. With this product your photo is inlaid into the front of the puzzle, and your guests sign the blank wooden pieces that make up the rest of the guest book. The back of each inlaid guest book is stained and sealed to deter your guests from signing the wrong side. Each piece measures approximately 2"x2", and custom names, dates or other shapes (figural pieces) may be cut into your puzzle. To order, you may use our online design tool, or select your desired size from the list below. For additional help in properly selecting a guest book to fit your needs visit the wedding guest book sizing page. "Inlaid photo guest book puzzle meant to accommodate an average of 50 guests. Photo typically measures approximately 8""x6""." "Inlaid photo guest book puzzle meant to accommodate an average of 65 guests. Photo typically measures approximately 8""x6""." "Inlaid photo guest book puzzle meant to accommodate an average of 85 guests. Photo typically measures approximately 8""x6""." "Inlaid photo guest book puzzle meant to accommodate an average of 95 guests. Photo typically measures approximately 8""x6""." "Inlaid photo guest book puzzle meant to accommodate an average of 100 guests. Photo typically measures approximately 10""x8""." "Inlaid photo guest book puzzle meant to accommodate an average of 120 guests. Photo typically measures approximately 8""x8""." 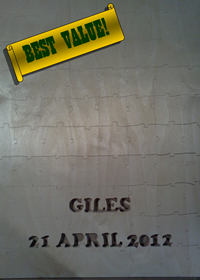 "Inlaid photo guest book puzzle meant to accommodate an average of 125 guests. Photo typically measures approximately 10""x8""." "Inlaid photo guest book puzzle meant to accommodate an average of 145 guests. Photo typically measures approximately 8""x8""." "Inlaid photo guest book puzzle meant to accommodate an average of 160 guests. Photo typically measures approximately 10""x8""." 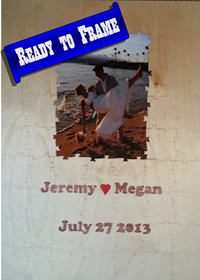 "Inlaid photo guest book puzzle meant to accommodate an average of 180 guests. Photo typically measures approximately 8""x8""."